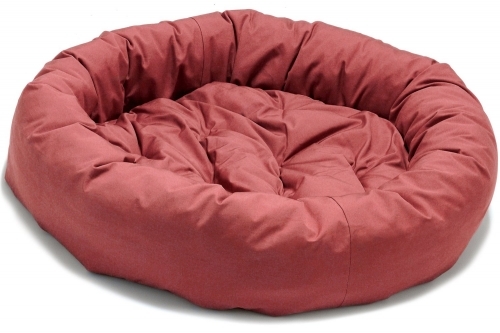 Dog Gone Smart Donut Red 42"
Dogs just love to curl up and nest in these cozy donut beds. Bolstered sides give a sense of security and protection which create a den-like atmosphere and help promote a sound sleep. Dogs just love to curl up and nest in these cozy donut beds. Bolstered sides give a sense of security and protection which create a den-like atmosphere and help promote a sound sleep. 100% soft cotton canvas. Our donut beds are generously filled with hypoallergenic soft hollow-core slick fiber fill. This high-quality fill allows dogs to nest which they love to do, but bounces back to a high loft when they leave! Our unique silicon-coated polyfill eliminates any lumping or unevenness to the bed. Wow, now that's something to bark about! © 2019 Henry & Rumble Canine Outfitter. All rights reserved.